GOING SOCIAL: Tech savvy Nepali Congress candidate Gagan Thapa campaigning on Thursday at Budanilkantha area which falls under his constituency. 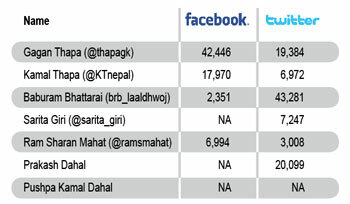 Thapa has the highest aggregate number of followers on his social media accounts. A quarter of Nepal’s population is now online, nearly three million of them are on Facebook and the mobile penetration rate is now at 65 per cent with 15 per cent of the population accessing the net through their phones. Even in the last election in 2008, most Nepalis were not yet on the net and hadn’t discovered Facebook. But political parties and younger candidates for this month’s elections have made debuts on social networking sites to woo voters. 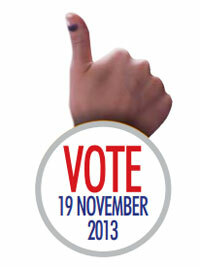 “Social media has already become an important campaigning tool in this election, giving way to dialogues. But since most of the users are still new to the medium it will be difficult to predict how decisive online campaigning will be,” says constitutional expert and former ambassador, Nilambar Acharya, an avid tweeter himself. In the run up to the constitution deadline last year there was a spike in postings and the internet became a virtual battleground for netizens, many of them indulging in hate speech. This time the postings are more partisan and an overwhelming number of posts by Facebook and Twitter users ridicule the political parties and their discredited leaders. One of the most prolific tweeters is Kamal Thapa of the Rastriya Prajatantra Party-Nepal who has been using social networking sites to push his agenda of a return to monarchy and a Hindu state. On the campaign trail in the dusty outbacks of the Tarai or in the mountains, Thapa is never far from his tablet and smartphone. Thapa’s opponents in the federalism debate, including Janajati activists who are for ethnicity-based federalism, have countered with a social media campaign of their own. 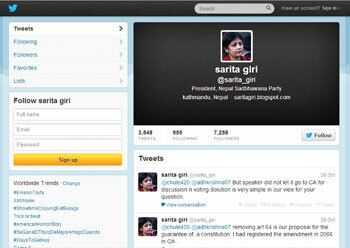 Thapa and anti-federalist Jana Morcha leader Chitra Bahadur KC have been singled out for vicious vilification on the net. 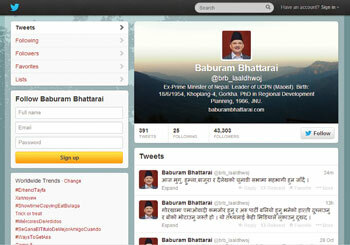 For now, Maoist second-man Baburam Bhattarai is far ahead of everyone else in terms of followers on Twitter, while Gagan Thapa of the Nepali Congress leads on Facebook. Both have been savvier than other candidates, with measured comments and minimal vilification of opponents and greater audience engagement. 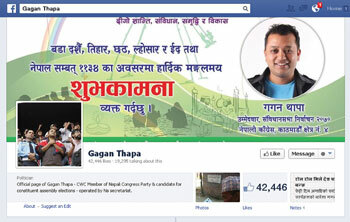 Gagan Thapa has also been using YouTube to post campaign songs, speeches, and videos of rallies. New and lesser known candidates like Ujwal Thapa of Bibeksheel Nepali were net savvy even before they entered politics and have been using social networking platforms to drive their alternative reform agenda. However, cyber experts say most political leaders, especially the older ones, don’t yet understand social media. And even those who use it a lot, haven’t learned that many of their propaganda postings can backfire badly. In September, Baburam Bhattarai’s Facebook status and tweet on ‘progressive nationalism’ generated plenty of negative reaction with people criticising the former PM’s double standards on nationalism rhetoric. In their attempt to gain visibility online, parties are mudslinging on social media and have realised that the mud flies right back at them. Online party mouthpieces have become a way for candidates to flex their digital muscle and threaten to make this election campaign nastier as it gets into the final weeks. The Election Commission’s ambiguity over guidelines for social media use in the run up to polls has left plenty of room for misuse of the medium. While guidelines were issued in India last week to regulate social media use for its election next year (see box), the same week, Nepal’s election commissioner Ayodhi Prasad Yadav said the EC had no capacity to monitor social media sites. Nepal is seeing a classic case of social media becoming an echo-chamber leading to ghettoisation of public opinion as users gravitate to sites that they agree with. Anonymous comments spewing racist insults and threats of violence have become common as social media allows the intolerant, political bigots, and outright racists unfettered access. India’s Election Commission issued detailed guidelines last week to regulate internet campaigns on Twitter, Facebook, YouTube, and other social networking sites, asking candidates to declare their social media accounts and all political parties to pre-certify advertisements before they are posted on websites. Political parties and candidates will now have to account for every penny spent on the use of social media for their campaigns for next year’s general elections in the world’s largest democracy. The growing number of techno-savvy politicians in India has led to a massive use of social media to reach out to the public. Bharatiya Janata Party’s (BJP) prime ministerial candidate Narendra Modi is one of the most intense users with over 2.6 million followers on Twitter. His nearest rival is Shashi Tharoor, who has over 1.8 million followers. India’s Election Commission requires all political advertisements posted on the Internet to be pre-certified, just like advertisements put out on electronic media, by the state and district-level media monitoring committees.